Sumbitted by Barry Geier from his personal collection. Two extra gallons of fuel and a Military Airlift Command C-141 StarLifter made the difference recently between crashing and landing safely for a Los Angeles light plane pilot and his three passengers. THE FIRST time that Rick Ray, Hollywood business agent for writers in the entertainment field, and Capt. William R. Bowman, instructor pilot and full-time Air Reserve technician with the 944th Military Airlift Group (Assoc.) (Res. ), met was at 10,000 feet over southern Arizona. Piloting a 63rd Military Airlift Wing C-141 on a "Kelly turn around" mission, Captain Bowman was at 35,000 feet near Tucson, Ariz., when the word was flashed that Ray was lost in a Mooney 21 aircraft somewhere near the Mexican border. Albuquerque FAA Center, N.M., and Tucson Approach Control requested assistance of the MAC crew and aircraft in locating him. STARTING LATE, the flight of the single-engine Mooney originated from Van Nuys Airport, Calif., bound for Tucson. Part of the delay was occasioned by Ray's caution in seeing that the fuel tanks were filled to the brim, though the topping off took only two gallons. Things progressed satisfactorily, once airborne, until he passed Yuma, Ariz. and was nearing Gila Bend. A line of thunderstorms blocked his course at the point, however, he was informed by radio from Albuquerque air traffic control that he could avoid them by detouring south southeast. UNDERSTANDING the controller to say a heading of 120 degrees would take him to Tucson, he set his course accordingly but saw only dark desert below. He couldn't reach air traffic control again and neither his automatic direction finder nor VOR navigational radio worked. Turning his transmitter to emergency frequency, Ray called to anyone who might hear him that he was lost and running low on fuel. A CONTINENTAL Airlines captain talking to Albuquerque heard his predicament, contacted him, then relayed the information to the center. Before the night was over, Ray talked with pilots flying Western and American Airlines jets as well as Albuquerque and Tucson, but was never in voice contact with Bowman in the C-141. Luckily he was within radar range of Tucson approach control and through the radio relays, he was given a northerly heading drastically changing his fligh direction. However, Tucson could not at this point verify the blip on their radar as Ray. AT THIS MOMENT, Captain Bowman and his crew entered the situation in the Starlifter while cruising s 35,000 feet 40 miles north c Tucson enroute from Kell AFB, Tex., to Norton. Receiving the request from the Albuquerque Center for assistance in locating the lost aircraft, Bowman diverted to the south and descended as rapidly as possible to 10,000. Captain Bowman then turned on all the aircraft's landing, taxiing, inspection and navigation lights. BY THIS TIME, both Ray's wing tanks were registering zero on the gauges, and, although on course for Tucson, he couldn't see it. "For 15 minutes, I contemplated eternity and waited for the engine to quit," he said. But time was with the faltering Mooney, it took the MAC crew only about 12 minutes to find the craft some 50 miles southwest of Tucson near the Mexican border. "AS IT WENT whizzing by me in a blaze of light on that initial pass," Ray said, "I had a momentary qualm of terror then a tremendous feeling of moral support. It looked just like a city of lights with wings." Since Ray was cruising at a bare 90 knots to conserve fuel, the C-141, with flaps down and throttled back as much as safely possible, couldn't fly slow enough to stay with him and shot by on each pass. WITH THE MOONEY in a imminent crash position, Captain Bowman circled back as quickly as the StarLifter could come about and confirmed Ray's direction of flight for Tucson as correct. Moments later, the runway lights of Ryan Field, a small private strip 10 miles west of Tucson popped up, and the Mooney dropped down from 8,000 feet for a rough but safe landing. The Norton aircraft then returned to its original course. Last week Ray visited Norton to say "thank you" to Captain Bowman and get a closer look on the ground and a tour through "the big bird" that saved him and his friends. 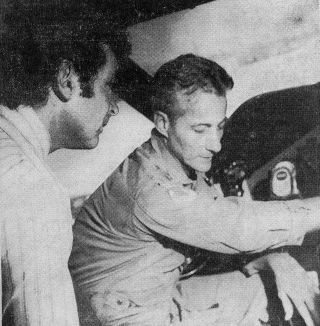 During the course of luncheon, he learned some of Captain Bowman's interesting background, such as two MIG kills in F-86 Sabres during the Korean War, experiences as a rescue crew commander on an HC-130H, Hercules and flying F4C Phantoms during a recent combat tour in the Republic of Vietman. BUT WHEN all the hanger flying was done over the luncheon table, Ray capped the whole thing with an observation concerning the aftermath of his harrowing experience that night south of Tucson. When the 52-gallon left wing tank was filled the next morning, it took 51. Those precious two gallons, in topping off at Van Nuys, saved four lives.